We had our housewarming party this weekend! Lots of friends came in from out of town (not my friends, Kelly’s friends.. but I pretend they’re mine). We had a full house, a full roof deck, and a full Gatorade cooler of something Aaron called Par 3 Punch. I’m not a big drinker at ALL, but somehow I ended up doing a shot of cake flavored vodka and chasing it with applesauce out of the jar. Peer pressure is the real deal. 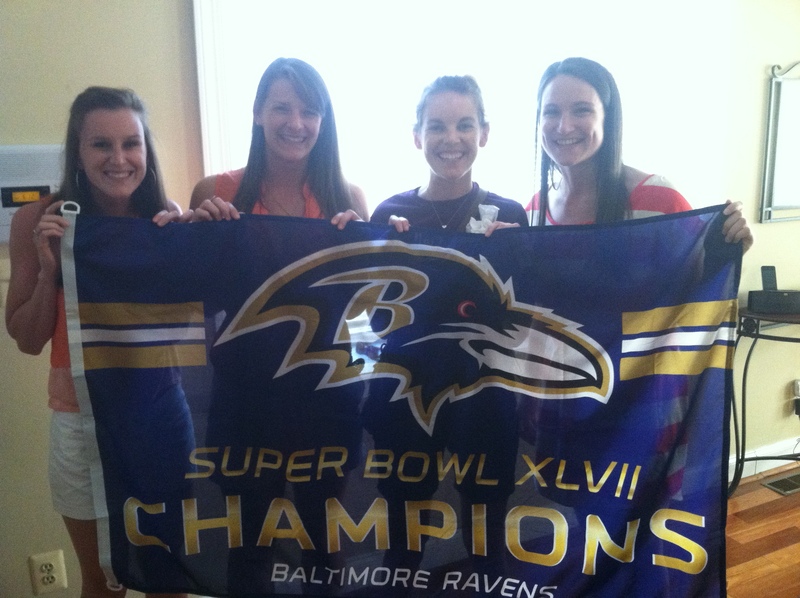 Roommates with our new Ravens flag, courtesy of Travis! The GS couldn’t make it to the housewarming because he was home in Rhode Island this weekend for a wedding, but he did give us an herb garden as a present! It has basil, rosemary, chives, and a tomato plant. I’m going through the basil like crazy, wishing that my bank account balance would allow me to buy some steaks to grill with rosemary and garlic, and pretending that I’m going to get a bountiful tomato crop from my windowsill. I wasn’t originally planning on sharing this on the blog because I already told you last summer how to make bruschetta, but I used it for dinner three nights in a row three different ways, which means it had to be good. I marinated some chicken in balsamic vinaigrette and Italian seasoning and cooked it on the stove. You should definitely grill it if your bank account balance allows you to pay for gas for the grill. 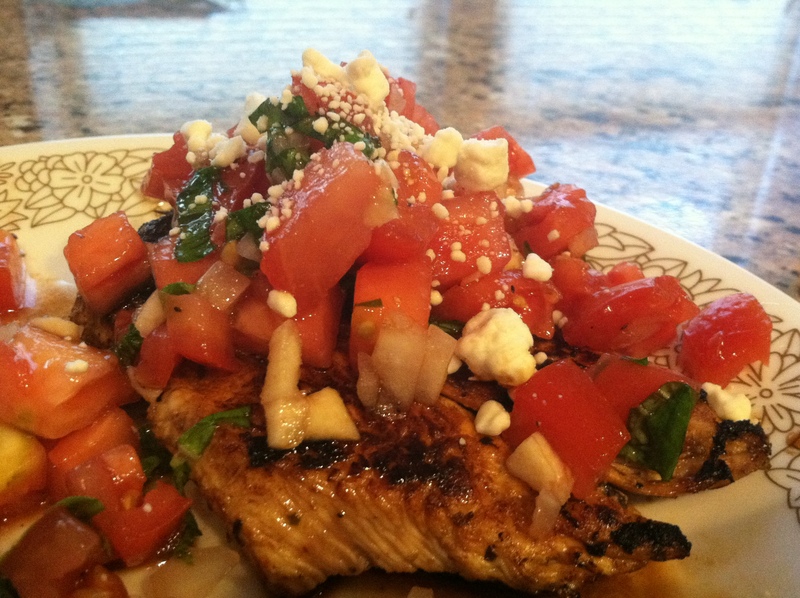 Night 1: Basic bruschetta mix over the chicken with a little crumbled goat cheese. 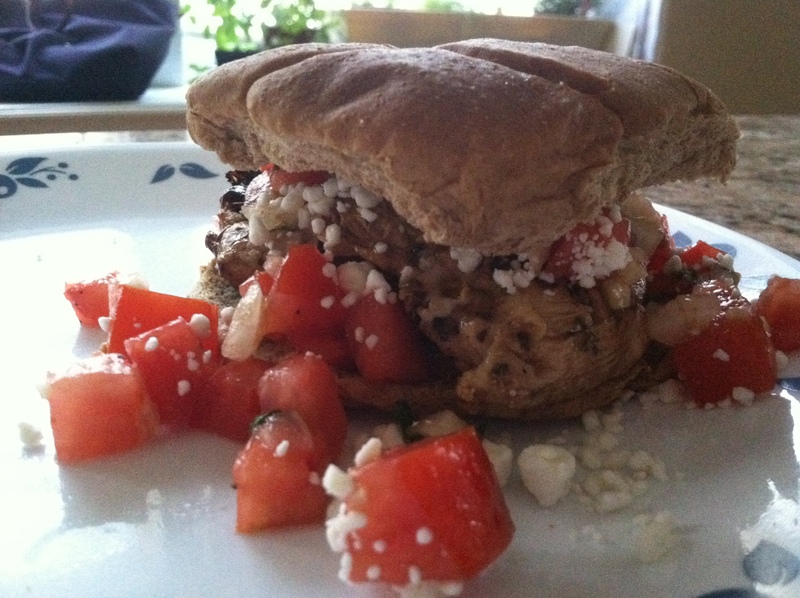 Night 2: Cold chicken and bruschetta mix on a toasted bun with feta and a little basil aioli (fancy way of saying, basil and mayo). 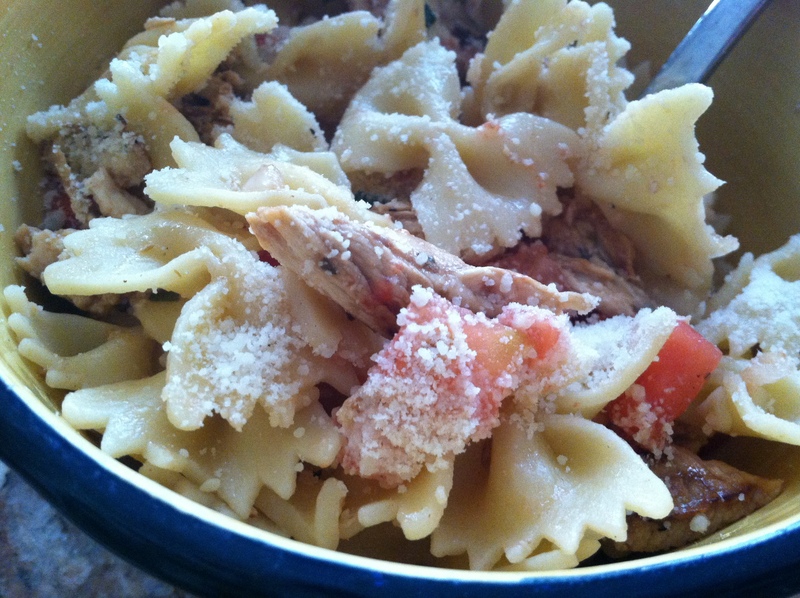 Night 3: Shredded chicken and bruschetta mix with bowtie pasta and parmesan cheese. There you go, three delicious uses for all those summer tomatoes and basil plants! The cake and applesauce shot, I do not endorse. totally your friends too !